I posted this last winter but I thought I would post it again. This is the perfect time of year to use a scrub to help keep your rough winter dry skin patches in check. So here is the low down on the the difference between a salt scrub and a sugar scrub and a DIY recipe too! Enjoy! So you may be wondering why use body scrubs? Should I use a sugar or a salt scrub? Can I make it myself? The good news; it’s easy to make it yourself for a fraction of the cost of buying one. Here is why you might like to try a body scrub: some folks, especially mature woman, find they have dry rough patches on various parts of your skin no matter how good your skin care routine. And this time of year, when it’s really cold and dry it really compounds the problem. This is when body scrubs can be particularly helpful. Body scrub ingredients helps to exfoliate the rough dead dry skin and moisturize at the same time. The scrubbing part is usually sugar or salt but sometimes grains like ground oats or almonds can be used too. The moisturizing part is often Sweet Almond oil or Olive oil, or any moisturizing oil. Scrubbers; Sugar is finer then salt and dissolves more quickly which makes it the perfect all around exfoliate. If you prefer something courser use salt but it is too abrasive for your face or sensitive skin and stings if you have a break in your skin. For something less abrasive try ground oatmeal, it is very gentle and is also a humectant but it won’t dissolve in your shower, so you may need to make sure it all goes down the drain. Moisturizer: You don’t have to stick with Almond or Olive oil. I like them because they are both very stable and have a long shelf life and are good for your skin. If you use virgin coconut oil it smells really yummy! 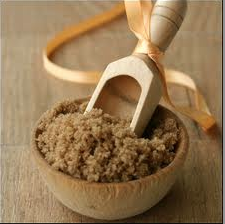 TO MAKE a body scrub simply measure out 1 part oil and 2 parts sugar, mix well and store in a wide mouth jar. You can add a drop or two of your favorite essential oil. TO USE: Step into your shower with the water off and apply it to dry skin (remember the sugar will dissolve in water). Being careful not to get water into your jar, take a small amount in your palms and rub onto your skin where needed. Rub for a minute or two and then turn the shower on to rinse off. After you towel off you can still apply your favorite moisturizer as usual. I apply the large Shea Body Butter to the problem areas. I find doing this at least once a week keeps my skin feeling smooth and comfortable this time of year. Posted by Maryclaire Mayes on Wednesday, January 29th, 2014 at 11:30 and is filed under Essential Oils.